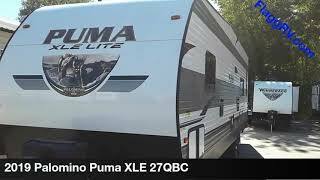 Hi, I am interested in your 2019 Palomino Puma (stock #02505) listed on Autotrader for $24,046. I'd like to get more information about this vehicle and confirm its availability. If you own this Puma XLE Lite toy hauler, you own a unit that will help you achieve all of your adventuring goals. Because of its 11 up to 15 10 garage, this trailer can bring along a wide variety of outdoor gear which means that whether you are an avid kayaker, biker, or hunter, you can use this trailer. The private bedroom with a queen-size bed will feel so relaxing after a long day on your feet, and the fact that you will be able to cook up a warm meal on the 2-burner stove top will brighten your evening dinner plans. This entire unit is not only fully accommodating, but it is also up to date and modern looking because of the Beauflor linoleum flooring that has been included throughout the interior. Palomino has graciously included with this trailer one year of 24/7 emergency roadside assistance through theCoach-Net RV Technical and Roadside Assistanceprogram, which means that you can travel worry free every time you are on the road. TheLED lightingthat is located throughout this trailer will keep your eyes and your wallet happy because of the brightness it brings to the trailer and the money it saves you on energy bills. Theskylightin the bathroom allows some extra sunshine to add a bit of cheeriness in the morning, and thetinted windowsthroughout this trailer are helpful in preventing fading of precious items inside.